There he was, a kid on the Lyon Part Dieu platform, eating a bag of Lays Nature. That’s when it hit me, in that pimply boys hands was the answer to all of these folk complaining about the failings of the word natural as pertains to wine. 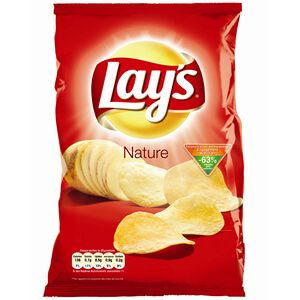 Chips Nature. Crepes Nature. Yaourt Nature. One way to translate nature here is PLAIN. It’s beautiful. It’s perfect. I love it. You’ve probably been aware of the upmanship, the bickering amongst my colleagues, about the failings of the word natural? The word is easy to co-opt. It has no meaning. Anyone can claim, natural. Joe Dressner almost had the last word, and his manifesto was so brilliant it should be, but then there was that damned bag of crisps. Well, what about if the word plain is used? For example, Torbreck has a flavor extension, their ‘Natural Wine Project.’ The copy, which is terribly odd, indicates that their other wines are ‘unnatural,’ which might well be, but besides the point. What is the point; would they have called this unyeasted beast the Plain Wine Project. There’s plenty more natural wine projects from other ‘brands’ as they call them coming around the bend, in the same way that Lays and other potato chip companies have different flavors for the crisps. But, who making fancy wants to put out a product that is ‘plain.’ Natural? Well sure, but…plain? It’s beautifully unsexy and flak-jacket proof, hey, it’s almost hipster-proof! In its translation it is sublimely uncool. No one will go, hey, is that wine PLAIN enough for you? However, what the wine is, is clear. The range of what is permissible is loose. As it should be. The people who want to make unadorned wine probably don’t care—they’ll find what they want to drink and be the market for a few fierce vignerons who are like-minded. The people who like the bells and whistles will be left trying to figure out how to ride the train with no ticket.